Every soldier can point to one buddy, one home boy, one best friend who saw him through thick and thin in wartime. One guy whom he could count on in a jam, to always be there for him. A guy to make him laugh, to give him a boost up when he's down and a guy to share personal triumphs and hardships. For me, that buddy was Dave Mansir, K Troop's cook 3-'68 till 3-'69. David, a husband and father of two died Tuesday, February 23 at his home in Gardiner, Maine from a sudden heart attack. His funeral was held at Staples Funeral Home, Gardiner Saturday, February 26 at 1:00. David's cremated remains were interred at Oak Grove Cemetery, Gardiner, Maine on Sunday, May 1, 2005 at 2:00. David always got my name wrong - Hershey with that wonderful down east Maine accent that was unmistakable. Jokingly, I would call him chin. I don't think two buddies were closer. If there were, I hadn't met them. I will miss David, more than I can say. He died too young and too suddenly. He is now with his mother and father, family and friends and his Blackhorse brothers. God rest you David, until we meet again. © 2005 Blethen Maine Newspapers Inc.
PITTSTON -- David L. Mansir, 58, of Peaslee Road, Pittston, died unexpectedly Tuesday, Feb. 22, 2005, at his home. David was a very dedicated husband and father. He was born in Gardiner, a son of Donald Sr. and Francis Buckmore Mansir, on June 7, 1946. David was a graduate of Gardiner High School, class of 1966, and had attended a wood crafting school in Boston for a year. He was an Army veteran of the Vietnam conflict. He had been employed for more than 25 years at the Gardiner Water District, most recently as road foreman. He was a member of the American Legion Post 4, Gardiner, and the Gardiner Lodge of Elks. He was predeceased by his parents; his sisters, Elizabeth Jarrett and Joan Lund; brothers Donald Mansir Jr., Stanley Mansir and Gary Mansir; and stepbrother Billy Rafford. He is survived by his wife of 33 years, Sherrill Branch Mansir of Pittston; two sons, David L. Mansir II of Pittston and Dean L. Mansir of Pittston; brother Richard Mansir and wife Ellie of Randolph; sister Louise Edwards of Florida; a very special granddaughter, Kaylin E. Mansir of Pittston; two stepbrothers, Robert Rafford and wife Joan of Middlebury, Conn., and Brian Rafford and wife Marge of New York City; three stepsisters, Vivian Van Wagner and husband John of Syosset, N.Y., Jane Mann and husband Tim of New Jersey and Pam Rafford of Brooklyn, N.Y.; his aunt, Nellie Fontaine of Augusta; an uncle, Stanley Buckmore of Gardiner; and several nieces, nephews and cousins. Visiting hours were held from 6 to 8 p.m. Friday, February 25, 2005 at Staples Funeral Home, 53 Brunswick Ave., Gardiner, where a funeral service was held 1 p.m. Saturday, February 26, 2005. In lieu of flowers, donations may be made to St. Jude Children's Research Hospital, 501 St. Jude Place, Memphis, TN 38105-1905. David's cremated remains were interred at Oak Grove Cemetery, Gardiner, Maine on Sunday, May 1, 2005 at 2:00. 47 people attended the grave-side committal on a cloudy, windy and chilly day. Following the service friends were invited to the home of David's widow, Sherrill Mansir for a luncheon. 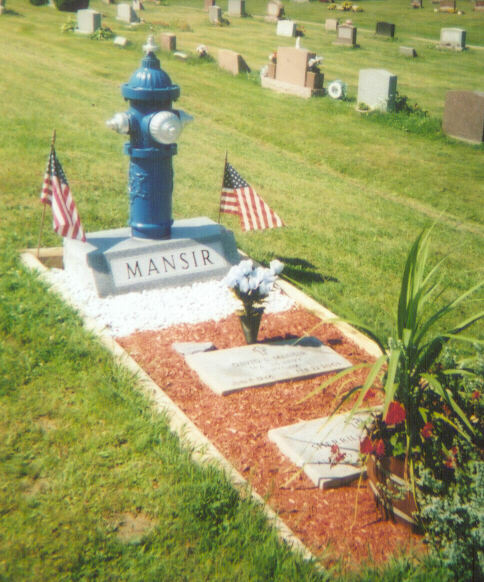 David Mansir was a career employee of the Gardiner, Maine water district. David's widow and family decided on an appropriate headstone for him, lovingly restored by his wife and sons. A fire hydrant that David no doubt worked on during his long career.